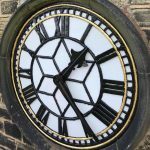 The three 1.2m dials which adorn the clock tower at Emmanual Church, Shelley, were recently restored after first been installed over eighty years ago. The work, which was part of a large project at the Church, was a great success and the dials are now looking ‘as good as new’. The clock at Shelley Church was originally donated by Mr. and Mrs. E Auckland to celebrate their diamond wedding anniversary in 1935. 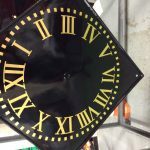 The clock and dials were fabricated and installed by local company William Potts of Leeds, who are now part of the Smith of Derby Group. In late 2018 Smith of Derby was approached by the local Church to complete a full restoration of the three dials as part of a major project at the Church. The glazed skeleton dials were restored in situ using scaffolding so that the dials never left their West Yorkshire home. The first step was to remove the clock hands so no damage would occur and then remove the existing dial glazing. Following this the existing paint on the cast iron dials and hands was removed using a wire brush technique so that new paint layers could be built up. Following the removal of the existing paint and glazing templates was taken of the original glazing so the new glazing could be cut, from 050 opal acrylic, to size to be installed as part of the restoration. A zinga primer was applied along with an undercoat to the hands and dials to ensure longevity, before a high-quality black enamel gloss paint to give an aesthetically pleasing finish to that of the original specification. One of the three restored clock dials and hands along with the dialworks. 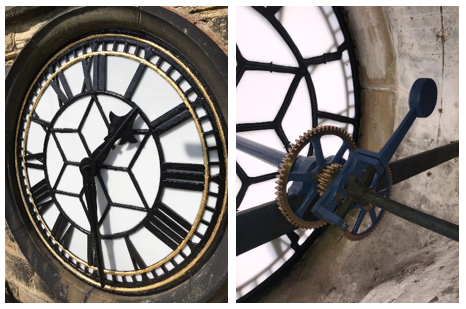 Along with the restoration of the three dials the dial works were dismantled and cleaned to ensure they continue to work well for many years to come. The team carefully completed this work before re balancing the clock hands against the dial motion works and lubricating the necessary parts.